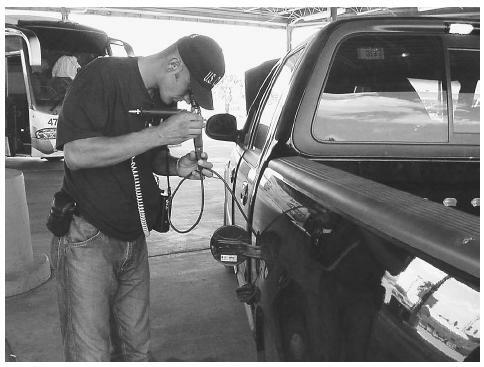 A supervisor with the Bosnia-Herzegovina State Border Service Agency uses a fiberscope to examine the gastank of a pickup truck during the International Border Interdiction Training conducted by the U.S. Customs Service at the Hidalgo port of entry in Hidalgo, Texas. U.S. Customs Service. < http://www.customs.ustreas.gov/ > (March 29, 2003).